Smack suits him! Very cute. What kind of dog is he? So cute! Oh my. I think I'm in love. Oh I LOVE Boston Terriers. Such vibrant personalities. When I grew up, we had two. They were amazingly lovable. You made me smile a great big old smile this morning. Thanks. And thanks, Smack! What a sweetie pie! Smack is simply adorable! Well I have a BUGG: half boston terrier half pug...and she is sooo cute: but now I see where she gets her big beautiful eyes...now tell me does Smack eat everything around the house like Zoey? want to see a pic of her? I bet Smack would like to meet and play with Coal, our long haired dachshund. He likes to be chased around the house by anyone who will do it with him. He likes to go next door and have a chase game with our neighbor's 7 year old Shih Tzuh. Coal is shortlegged and can go under the landscapping bushes and Zack can't. Then Coal will ambush Zack and the chase is on till one of them gets too tired to keep running. Does he actually smack? Just wondering...b/c my not-so-little Stella smacks us and other dogs when she's playing and wants attention! :) Her not-so-little paws can be dangerous! Cute pic! What an adorable boy doll! I want to hug him. I couldn't agree with that expression more! Ohhh, looks like my Biscuit! I love Boston Terriers. Biscuit is so smart and friendly. Right now I'm trying to get her out of the habit of nipping when she wants to play. Can I have him? btw, I was inspired by you and now I do a "scenic sunday" only I've been unable to tame my tongue and I end up typing up things about the pics. heehee. Seriously though, I want him. I want your Smack! oooh, he looks just like my Dexter!! How cute! 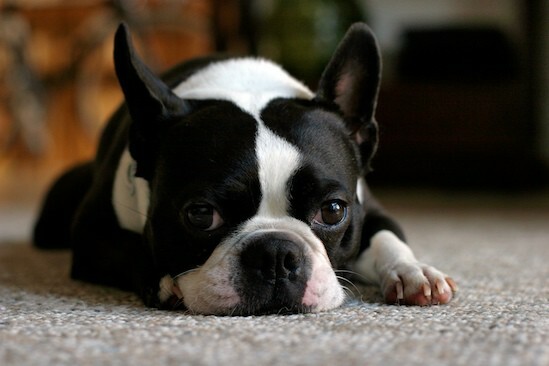 I LOVE Bostons...they have the most soulful eyes! Adorable!! hop over to our blog...let me know what you think..we'd appreciate it! So cute! My pug would love to run around with him for sure. Smack is adorable. I used to work at a kennels and I had this dog, Boston Terrier, named Elvis. I would have him each time he comes in to groom him. He was such a sweet dog. Such a cutie! Dustin: I should stick him on a plane to go visit you guys! He is sooo adorable!! What kind? This is the first time on your site. Mt sister-in-law Aggie, from the blog Aggie's Kitchen told me to check it out. I got a big smile when I saw this picture of your gorgeous Boston. I have 2 Boston Terriers! They are the greatest dogs.Now, I'm going to check out more of your site and that Focaccia Bread post I saw. Looked wonderful! Ah, he's the cutest. We were going to adopt an older pug mix, but they wouldn't let us have him because we have a toddler, they said he was snappy. We're on the lookout now for one that needs some love. Angie, I have a BUGG who is half boston terrier and half pug - the most loving thing u would want to have with a toddler... such a loving nature these dogs are so you go hunting...and they want to be hugged and cuddled and touched.